Need side dish inspiration for your weekend BBQ? 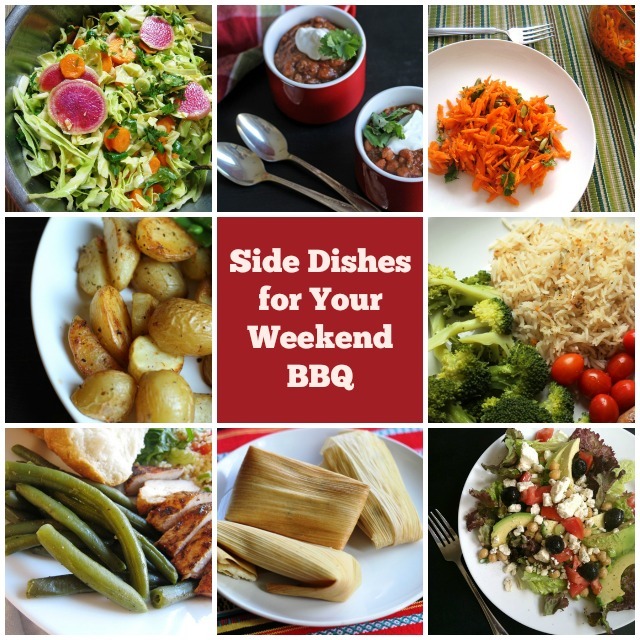 Check out this compilation of EASY side dishes that your friends and family will love. As the weekend approaches, you might consult the grocery ads to see what’s on sale in terms of meats suitable for grilling. At my Ralphs, there’s lots of beef and hot dogs on special. Sprouts has chicken. Once you get the meat figured out, the sides can be pretty easy, especially if you vary the textures and choose some make-ahead recipes. Need some help? Check these out. Easy Slow Cooker Chili – Offer small ramekins or mugs so folks can easily manage it all. Healthier Refried Beans – Cheap eats never tasted so good! The Go-To Salad – This is one of my favorite salads EVER. Cumin-Scented Cabbage Salad – You will be amazed at how easy this is to pull together. Carrot Salad with Cilantro and Pepitas – Bust out of your traditional slaw and make this! East Roast Potatoes – Consider making a double batch, these are so good. Lemon and Herb Rice Pilaf – Easy and tasty, this comes together quickly on the stovetop. Cheesy Corn and Chile Tamales – These are my cheater tamales since they’re so easy to make. You will impress the masses with these. Easy Garlic Green Beans – Got ten minutes? That’s all you need. Sauteed Corn with Fresh Thyme – Whether you use fresh or frozen corn, this will be great. Mixed Grilled Vegetables – It doesn’t get easier than this! What’s YOUR favorite side dish at a BBQ? The list of side foods is endless and various depending on my target audience. Since everyone coming tomorrow enjoys seafood, I am making for appetizers phyllo dough cups stuffed with a crab stuffing and also Portugese Steamed Clams. For our main dish, my hubby is making his famous baby back ribs. He makes his own sauce which is nothing like the typical BBQ sauce. It is made from vinegar, onions, a little sugar, pepper, ketchup, and Worcestershire sauce. I’m not usually a “rib” person but his I love and so does everyone else. He has been deemed the “rib king” among everyone that’s eaten them. For sides, I’m making baked beans which I ALWAYS have at all my cook outs. I’m also making potato salad and tomato salad and corn on the cob. At the end of July, we are hosting another BBQ and the sides will be different based on the guests I will have on that day. Tomorrow’s BBQ is a small one – only 7 people so I can’t make so much that I’m left with a ton especially since we have another BBQ on Saturday. Typical sides that I always have are baked beans, potato salad, pasta salad, (and I make several different kinds so it depends on what I’m in the mood for), devilled eggs, tomato with fresh mozzarella, basil and a drizzle of olive oil, Stromboli, shrimp cocktail, and the list goes on. But these are the usual suspects. Can I come to your house?! Sounds great! That is very cool. Thanks for the tip! Some of our favorites include pasta salad with vinaigrette; black bean and corn relish; cranberry-apple chili relish; pineapple chunks with shredded coconut; watermelon wedges; creamy cucumber slices with dill; and of course baked beans. I rarely serve potato or macaroni salad or deviled eggs. My people do not like these. Do not ask me, I do not get it either. I wonder if they’ve always been served “sweet” potato salad, mac and eggs. The sweet pickles are typical. My husband didn’t like those items until I made them without the sweet. Hmm… I know my husband does not like mayo, but I never thought about the sweet pickle relish. None of my children will eat it so you may be on to something. Thanks for the idea. I will have to try a small batch without the pickles and see if anyone else likes it.